Police and state sanctioned violence towards Black people in America is not new. But, the past two years have brought it into sharper focus as incidents are increasingly captured on video, spread through social media and become rallying points for direct action and change. Knowing the stories of victims and watching sometimes gruesome videos have been critical for galvanizing the ongoing #BlackLivesMatter movement and the incremental wins that we have begun to witness. But, these same tools can also often leave me as a Black woman emotionally exhausted, and often times scared and anxious. I’ve screamed, cried and protested over the realization that India Clarke, Sandra Bland and Rekia Boyd all could have been me. So sometimes I find myself trying to avoid the trauma, the anxiety and fear by ducking and weaving in and out of #BlackLivesMatter movement spaces, taking social media breaks, and sometimes altogether avoiding conversations about state and police violence. 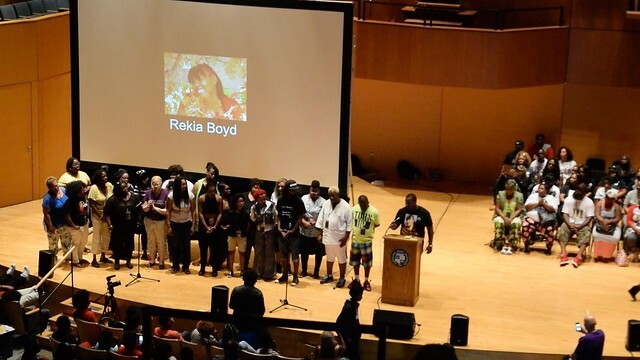 Feeling an extra emotional fortitude last week, and knowing that an explicit intention of the Movement for Black Lives Convening was to create spaces for Black people to begin to heal from the many traumas we face, I decided to attend this past weekend’s gathering at Cleveland State University in Ohio. I’m glad I did, because there was a palpable sense of love and healing on that campus. The Convening was intentionally an all Black space. Underlying this decision was a key guiding principle: the most directly affected people are experts at their own lives and should be at the center of the movement. There is something about being in a space where you know everyone intrinsically gets your pain and has experienced some version of it that is inherently comforting and healing. The work of explaining and of articulating your grief and trauma isn’t required. It is easier to feel your feelings and trust that others are standing with you, sharing your pain. We’ve got nothing to loose but our chains. I left the space that night feeling a deep sense of gratitude to the families who still fight even in the midst of delayed justice. Buoyed by the strength, commitment and life-saving hope contained in that auditorium, the collective healing process began to do a work in me that night.